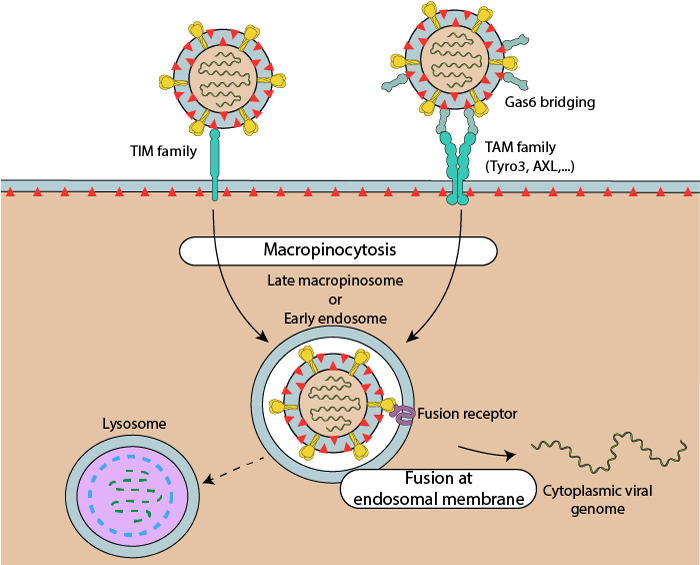 Enveloped virus membrane, like all cellular membrane, comprises phosphatidyl-serine (PtdSer). This molecule is actively kept at the cytoplasmic surface of the membrane by an enzyme called flipase through ATP consumption. Envelopped virion do not produce ATP, therefore PtdSer ends up at the surface of virion membrane. This somehow disguises viral envelopes as apoptotic bodies, that also present PtdSer at their external surface. Exposed PtdSer is recognized by dendritic cells and macrophages, and induces macropinocytosis uptake of these components. Most enveloped viruses evolve to avoid this degradation by covering their membrane with envelope proteins. Some other are exploiting this route of infection, mostly viruses which are macrophage and/or dendritic cells tropic. These viruses are catched by phosphatidylserine receptors on macrophages/dendritic cells and enter into the cell by macropinocytosis. .